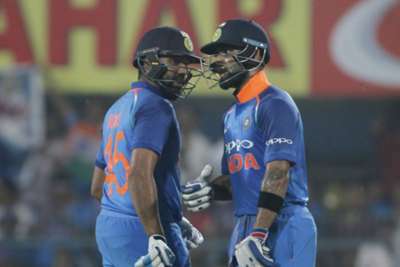 Virat Kohli hailed the performance of Rohit Sharma as the pair put on a stunning 246-run stand for the second wicket in India's comprehensive ODI victory over West Indies on Sunday. Kohli outshone his team-mate early on in their side’s successful run chase in Guwahati, though that is not to say Rohit did not play his part in the second-wicket alliance. Both men reached three figures before Kohli was eventually dismissed, his departure allowing Rohit to cut free and fire his side to an eight-wicket win with 47 balls to spare. "It feels pretty good," Kohli said at the post-match presentation. "It was a convincing win. "I thought West Indies were really good with the bat, and 320-plus totals are always tricky. "But we knew it was all about one partnership, and life isn't difficult when Rohit is at the other end. I've always enjoyed batting with him. "I've preferred the anchor role [in previous partnerships] but today I felt good and I communicated with Rohit that he should play the anchor role. "And when I got out, he took over and [Ambati] Rayudu played the anchor." West Indies captain Jason Holder was not too downbeat about the defeat in the series opener, Shimron Hetmyer's century providing a positive for the tourists. "[I am] extremely pleased with the batting," he said. "Credit to Hetmyer, it is always good to see a youngster do well. "I thought it was a decent effort with the bat, but life was difficult for our spinners under the lights. "I would agree we were 25-30 short. "I felt we were par, and then we got [Shikhar] Dhawan's early wicket, but credit to Kohli and then Rohit. We needed a few partnership breakers."